Peggy, aka Bob's Peggy, is a 4-year-old fawn female born October 8, 2009. Her sire is Flying Penske and her dam is Bob's Tonya. 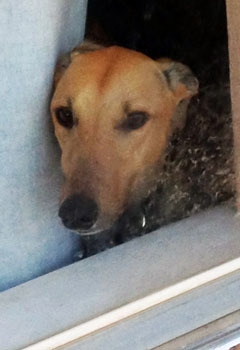 Peggy has 78 races to her credit on Greyhound-data.com, all at Gulf Greyhound Park where she was racing at the AA level. Her career started on May 21, 2011 and ended with a compound fracture to her right rear leg on November 10, 2012. After evaluation by Dr. Alice Runk of Central Texas Veterinary Specialty Hospital, it was decided to amputate the leg due to the severity of the break and an infection. Peggy has fully healed from her amputation, and is ready to hop right into a forever home! Peggy should not live with cats or small dogs. This little girl has no idea that she only has three legs. 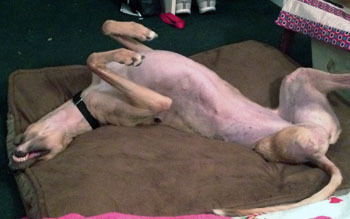 Even with three legs, she is still the Class AA racer that she has always been. With her high prey drive, she doesn't miss a thing! She is the first one out the dog door when there are dogs walking past the fence – always to say hello first! We call her Peggy Roo since she looks like a mini kangaroo from the back – except when she's running. When she's running, she's as smooth as she ever was. 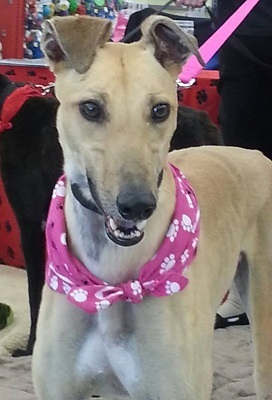 Her transition from great racer to house hound has been remarkable. She is very smart and has a high desire to please. Using clicker training she has learned sit, down, stop, wait, and stay. She has even learned about toys. When her foster sisters take toys out into the yard, she brings them back into the house and hides them in her bed (finder's keepers). She doesn't have any space or food issues. She gets along great with her two foster sisters. And she roos! She's looking for her forever home - Come and meet her – she has the softest fur and who can say no to those beautiful big brown eyes! !